Minimalism seems to be a pretty hot topic these days. Films like Affluenza and The Story of Stuff have people thinking about all the stuff society encourages us to covet, leaving us feeling unfulfilled until we can afford that next gadget. As a result of this thinking, many people I know can’t stop talking about tiny houses, barefoot running, or blogs like Zen Habits. Even the Harvard Business Review recently ran an article about minimalism applied to one’s career! About a year before I moved to Vancouver, BC, I started ruthlessly downsizing my possessions. In the process I started becoming more familiar with the community of minimalist bloggers and their work. Over two years ago, I published a review of Simplicity by Joshua Becker, the writer over at Becoming Minimalist. Today I’m in a far different place than I was three years ago, but I’ve still been continuing to read the literature. Unclutterer is my favorite practical guide to keeping my stuff under control (check out Unitasker Wednesdays for a laugh! ), and Becoming Minimalist exemplifies how an average family of four can live simply without going to extremes. Another blog I often enjoy is Courtney Carver’s Be More With Less, which focuses on cultivating intentionality in readers. One of my favorite posts is “Immediate Gratification is for Sissies,” which encourages readers to keep their eye on the prize and not compare their progress to anyone but themselves. 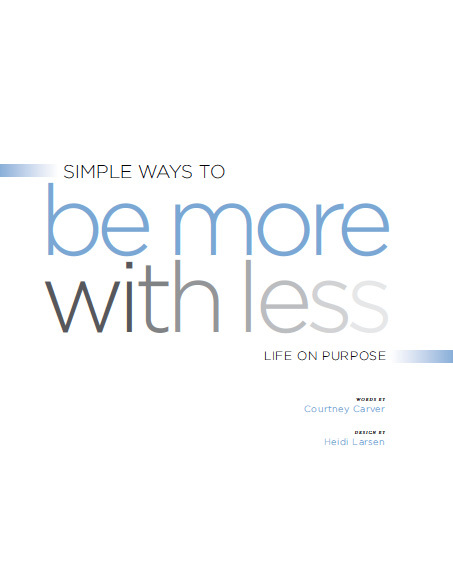 This week I had the opportunity to read a review copy of Carver’s ebook Simple Ways to Be More With Less. At the beginning of the book I started getting trepidatious. Most of the thoughts seemed extremely simple, and seemed to be addressing an audience that had just discovered minimalism last week. As I read though, I got engrossed. The chapters about dreams and dream-killing gave me much food for thought, and I remained engrossed through the end. After reading the last chapter, I realized the book was progressing to offer something of value for everyone. Content curation can be as important as creation. Many minimalist bloggers seem to be fond of monetizing their blog content by releasing ebook or print versions of their posts, and this book wasn’t completely free of that tactic. For example, this post about drinking a glass of water first thing in the morning was right in front—albeit slightly enhanced. While I didn’t go searching every chapter to know if it had appeared in blog form first, a quick search of the guest contributors seemed to suggest their words had not appeared on Be More With Less before. In the case of Leo Babauta though, his chapter was about Focus—incidentally, the name of one of his ebooks. One thing I really like about the better minimalist books, including Simple Ways to Be More With Less, is that they are worth returning to again and again. On first read, the chapter about dream-killing tickled my fancy the most. Perhaps by the end of the year, I’ll return to the chapter about gift giving. The book can meet you where you are at a given point and still offer you something. I’ve had a print copy of Leo Babauta’s The Power of Less for two years now, and I’ve revisited the book a number of times for a minimalist perspective on specific conundrums. If you’re new to minimalism and dying to buy your first ebook by a minimalist blogger, this would be a pretty fair choice! If you’re an avid reader of Be More With Less and the other major minimalist blogs, you may discover a couple more voices in here you hadn’t know about before. At any rate—worth a read if you are so inclined. Thanks to Courtney Carver for the review copy of her book! Find it here: Simple Ways to Be More With Less.